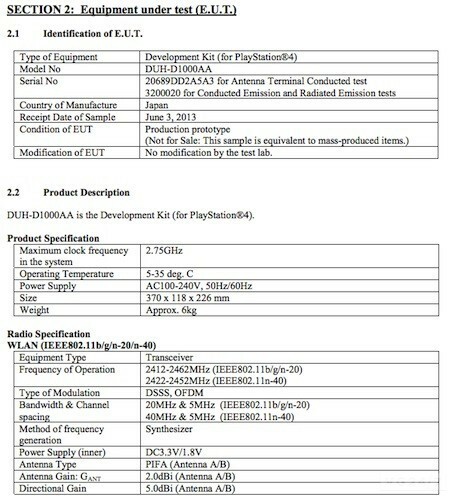 Well earlier in the week the FCC posted a few images of the Playstation 4 Development Kit and the console’s specifications. 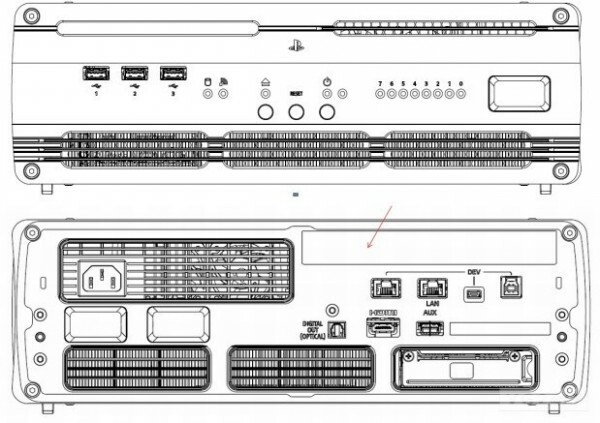 The Development Kit is sporting three USB ports on the front of the console, presumably USB 3.0 connections. It has the On/Off and Eject buttons and it also has a lot of lights, we have power indicators, WiFi and HDD usage indicators but what I find interesting on the front of the console or those lights, labelled ‘7’ down through to ‘0’. On the rear of the console we have the power connector which is a standard power connection. We have got the LAN, AUX, HDMI and Optical Audio connections and then there are the Development connections, one of this being another LAN connection. The console, named as the DUH-D1000AA is a prototype sent for FCC testing. If you look at the Product Specification you will see the ‘Maximum clock frequency in the system’ being 2.75GHz. By all means this isn't a clear indication of what to expect but it is interesting nonetheless.